Co-op have some good deals on currently. One of them is massive boxes of Daz powder at £5.50 for 80 washes. That's less than 6.9p per wash. Definitely one to get you "only under 10p a wash or its not a deal" excited. Tesco have sold it for £16.34 previously and it's currently £12.99 in B&M. Think it's only the larger stores stocking so you wont find it in their smaller stores. Also have Plenty 8 roll for £4, Pampers Wipes 12x54packs for £10 and 16 piece dinner sets for a tenner also. That must be good deal because we shipping few k daily to stores. can't find it on their website? Never used DAZ. How does it compare to say Persil or Ariel on performance? 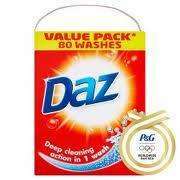 I've never used Ariel but my boys get there clothes filthy and they come up just as good with Daz as they do with Persil. Will be going to look in the morn. is there any is peterborough any1 know? Will go back tomorrow morning and check if they have any more stock in. Cannot find any store stocking this within 10mile of Blackburn! amazing deal. hope theres still some left when i go tonight. I have been to three different shops and no one knows anything about this deal. It does not exsist so please expire this now. I have been to three different shops and no one knows anything about this … I have been to three different shops and no one knows anything about this deal. It does not exsist so please expire this now. The deal does exist. A few have commented they have bought some so it is a national deal.. As I said before it's large stores only. It also probably isn't being run by independent societies. Noticed your Glasgow, I got it in Crown St. Have you tried Croftfoot, Castlemilk, Paisley, Dennistoun, Stepps, or Renfrew? anybody know if thers any stock in west midlands area? 2 pallets of these at the entrance to Cinderford Co-op(Forest of Dean, Glos) this morning - Bargain ! Noticed your Glasgow, I got it in Crown St. Have you tried Croftfoot, … Noticed your Glasgow, I got it in Crown St. Have you tried Croftfoot, Castlemilk, Paisley, Dennistoun, Stepps, or Renfrew? Yes tried Stepps, Muirhead, Lenzie, and Moodiesburn but nothing and none of the staff knew anything about it. Must just be in England only. OP just said they got theirs in Glasgow. Offer definitely still on, I got two boxes on saturday from co-op leeds in beeston. Had to ask the guy because they weren't on the shop floor and luckily enough, they just had some delivered! I went especially to the Co-Op at Trago Mills to get some on Sunday but couldn't find it anywhere so had to buy a small box of something else as I had ran out of washing powder. Then on the way out I saw them on the floor by the door right infront of where I walked in probably with my eyes closed! Went to the cigarette counter and got two boxes.